Less than two weeks from graduation, some UNLV students seemed a bit more prepared for taking on the challenges of the real world, according to the Las Vegas Sun. 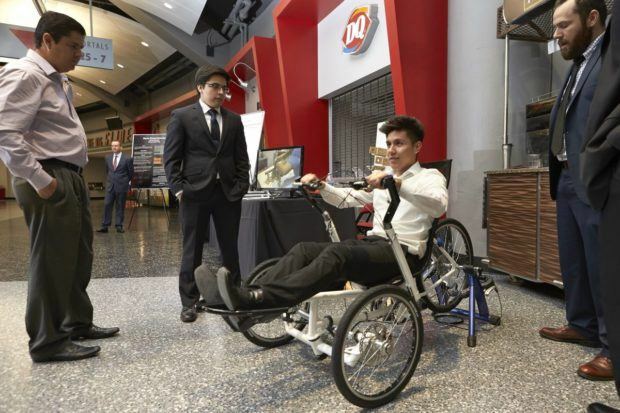 This year, 64 engineering students competed on 25 teams for the Fred and Harriet Cox Senior Design Competition — a biannual showcase of technological innovation and engineering acuity. The funds from Fred and Harriet Cox also give students access to the materials needed to complete design prototypes. A panel of local tech industry leaders judged the students’ efforts, with nearly $20,000 in cash to be awarded. Best in show received a $4,000 grand prize. Prizes of $1,500 for first and $750 for second were awarded in multiple categories. This fall’s projects included: an Intravenous Rapid Injector to administer anesthesia rapidly from within a vein to help alleviate patient discomfort and procedure time; a pedestrian bridge across Maryland Parkway to create a continuous flow of traffic for vehicles and pedestrians and reduce potential accidents; and a more accurate way for military and law enforcement to know the rounds remaining in a magazine using an array of magnetic sensors and a magnet. On December 16, 2016, winners from the Fall 2016 Fred and Harriet Cox Senior Design Competition were recognized and awarded for their product prototypes that were displayed and judged on December 7, 2016. The luncheon event celebrated the culmination of their undergraduate years studying engineering and their work on this important capstone project. The competition required students to work in teams across engineering disciplines to create a prototype. Sponsors of the Fall 2016 Fred and Harriet Cox Senior Design Competition include: Fred and Harriet Cox Endowed Senior Design Fund, Switch, JT3, NV Energy, and Las Vegas Paving. My website padrak.com/vesperman links to the Gallery of Clean Energy Inventions Exhibit. Profiled are 16 larger generators, 28 smaller generators, 20 advanced self-powered electric vehicle innovations, 26 radioactivity neutralization methods, 24 space travel innovations, 14 technical solutions to water shortages, and torsion field school network. The exhibit also includes 63 Hubble Space Telescope images and 25 movie posters. The exhibit can be installed in conventions, festivals, and any suitable public buildings such as universities, city halls, museums, shopping malls, and libraries. I am still looking for a suitable location on the UNLV campus for an exhibition. Hopefully the exhibit would inspire a few UNLV engineering students to build careers around developing and commercializing some of these futuristic inventions.